Our current companions are Hemi (for "Hemingray"), so named because we collect glass insulators manufactured by the Hemingray Glass Company, and Amber, as in "Amber 8" and "Amber 11". In 1988, we adopted Tigger, who had been living with Bill's mother until she moved into a retirement apartment. After becoming involved with the Feline "notes file" (an internal bulletin board) at Digital, we decided to add to our family in 1991. In the beginning of June, we brought home "Hemigray". It soon became clear to us that this kitten needed another youngster around. During a Feliner visit to the Pat Brody Shelter for Cats in Lunenburg, MA in late June of 1991, CJ (short for "Crown Jewel") and her sister Penny (short for "Pennycuick") came into our lives, bringing the cat count to four. Shortly after celebrating the twins' first "birthday" (May 2) and after a few days' absence, our neighbor's son discovered Hemigray in the woods. She had passed over to the Rainbow Bridge, but we were grateful to know her fate. 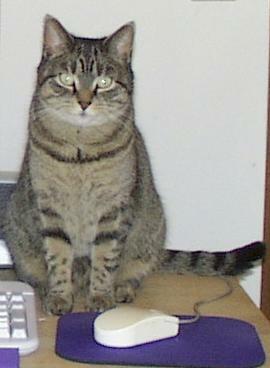 In October of 1995, after a brief display of symptoms from what might have been a long illness, we made the decision to send Tigger along to the Rainbow Bridge. 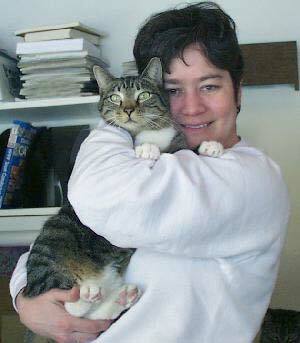 In August of 1996 we finally had to admit that Penny could no longer live with us, but we came home with Hemi. We learned that Penny passed over soon afterwards from an illness. CJ has always been our gypsy cat. We once let her out one night at the end of September after we got back from a weekend trip, and she didn't come back until the middle of December! We were almost ready to get another cat at that point. I had just bowed out of another weekend trip with Bill that day in December, and he was on his way there when my sister called to me from the front door that there were 2 cats waiting to come in. I couldn't believe it! Of course, it was several hours before Bill would arrive at destination for me to call him, but I managed to catch him walking in the door to report the news. I think that made his day, too! Ever since, I've been so glad I skipped that trip. We took her to the vet just to have her checked, and he said she looked fine and someone must have been feeding her. We were tempted to put a note in the paper asking who had done it! In June of 1999, we were planning to drive to Arizona for our annual insulator show, but CJ wasn't coming back and we didn't want to be gone for such a long time with her missing. We printed up flyers and did the neighborhood rounds. Most people were sympathetic, and we met some new neighbors. One person said "well I hope she didn't get caught by the foxes, you know there are foxes out here". Thanks, just what we wanted to hear!! CJ came back a couple of days after our "drop dead date" for driving, so we flew instead. It turned out for the best, since it was so HOT that we wouldn't have been happy campers if we had driven. And we ended up one of our trips of a lifetime that fall. I often read the "lost cat" ads in the local paper since we're always seeing visitors around. Bill once took a picture out the window and put it up on the web to show to someone. We were thinking of a Cats of Carlisle site where you could register your cat with a picture to help locate the wanderers of the community!